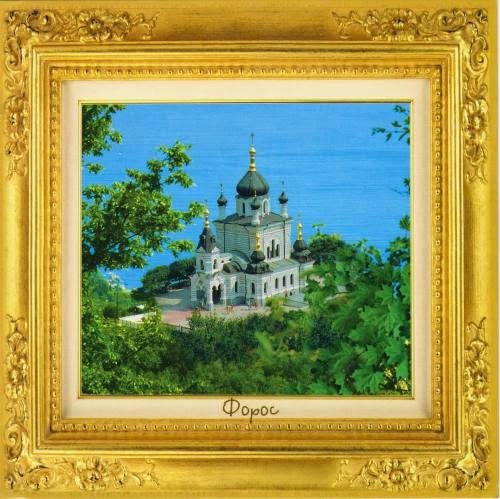 Postcard UA-574523 from Ukraine in 2013 shows the Foros Church, Crimea, Ukraine, overlooking the Black Sea from a 400-meter cliff. However, as a result of the 2014 Ukrainian revolution and subsequent annexation of Crimea by Russia, the sovereignty over the Crimean Peninsula is currently disputed between Ukraine and Russia. According to Wikipedia, "on March 11, 2014, Supreme Council of Crimea and Sevastopol City Council adopted the Declaration of independence of Autonomous Republic of Crimea and Sevastopol. Following contested referendum in which an overwhelming majority indicated a desire to join the Russian Federation, Russia signed a treaty of accession with the self-declared independent Republic of Crimea, absorbing it into the Russian Federation." Although Ukraine and it's allies refuse to recognize the annexation, the Crimean Peninsula is now de facto controlled by the Russian Federation. The situation caused confusions how to send mails including postcards to Crimea. An item from the Ukrainian State Enterprise of Posts website "UKRPOSHTA" indicated that the transportation of postal items and periodicals destined to and from AR Crimea and Sevastopol city has been renewed as of March 18, 2014, while another article dated September 10, 2014 warned that the Crimean Post refused to accept postal items, especially periodicals, from continental Ukraine. As of March 15, 2015, USPS states on it's service alerts web page that delivery services for international mail addressed to Crimea (postal codes in the range 95000–99999) are still suspended. Politics aside, mails to residents of Crimea have been reported to be routed through Russia with "Russia" as receiving country and Russia's new zipcode for the Republic of Crimea and Sevastopol, adding number "2" to the original Ukrainian zipcode. For example, for an Ukrainian zipcode in Simferopol "95000", the new Russian zipcode is "295000"; for an Ukrainian zipcode in Sevastopol "99000", the new Russian zipcode is "299000". Postcard US-3238647 reached Crimea in this practical manner in 26 days.